Every Friday, Welcome to Level Seven presents a comic book cover related to the Marvel Cinematic Universe that we find extremely cool. Here is a cover by Jim Steranko that portrays exactly why Jim Steranko is a master of comic book art. Now, what really appeals to me about this cover is how it revels in the pulp sci-fi covers from the decades before this cover would have been published. The tech Fury is wearing, the energy and movement juxtaposed against the static and tranquil star field. 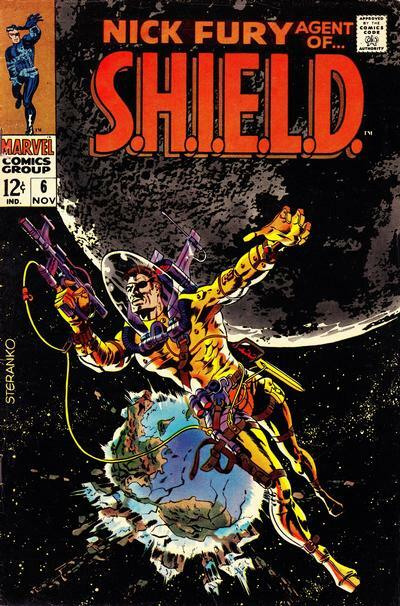 For this book, Jim Steranko did not draw the story as he did for some of the other issues in this series. Part of me is not interested in reading the actual story. I'm content just to look at the cover. It tells all the story I need. You can guarantee that we will be spotlighting Jim Steranko covers again. Quite literally, “Cool Comic Covers” could simply use the name “Jim Steranko Art” but we want to spotlight other creators, too. View other Cool Comic Covers here! Comic image from the Grand Comics Database under the Creative Commons Attribution 3.0 Unported License. The story is pretty decent with aliens and sci-fi tropes.